The Vane Technology Principle, a method of measuring and monitoring the flow of different media trough piping, has been proven worldwide. Kobold flowmeters and monitors work with this proven principle. Instrotech is offering the Kobold DFT rotating vane flowmeter, the equipment of choice whenever traditional impeller technology is to be used for the measuring or monitoring of volumetric flow rates. The modular design of this type makes the system universal in use, inexpensive and space-saving in operation. The DFT completely fulfils requirements for efficient and low-cost production methods. Due to the option of a PTFE housing, users get a resistant and highly reliable measurement system for operation in aggressive media. The wide measuring range of 0,2–2,0 l/min up to 3–60 l/min means that DFT rotating vane flowmeters can be used for a wide variety of applications. With a maximum operating temperature of 80°C and a maximum pressure of 16 bar (if the brass housing is used), this device can be used for almost all process conditions. The heart of the Kobold impeller is a securely embedded ring magnet, which is hermetically sealed against the respective medium. It transfers the rotation of the impeller to a Hall sensor fixed to the housing with a space-saving attachment. 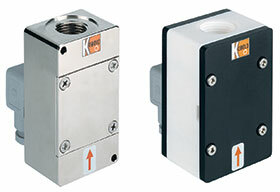 This sensor in turn transforms the rotational movements into a frequency signal in proportion to the volumetric flow. The downstream Kobold electronic evaluation unit then transforms the signal into either a digital display or an analog normalised signal, or it can be used to switch up to two limit contacts. LEDs show operational readiness and switching state of the limit value relay. Also, counter or dosage electronics can be used. In combination with the Kobold electronic unit this system provides extremely accurate measuring results under difficult conditions. Typical applications are in cooling water monitoring, general mechanical engineering, wastewater treatment, heavy goods and in the chemical industry.